The perfect helmet should be like the perfect saddle. You know it’s right when you forget that it’s there. No pressure on your body, no need to contort and adjust. In an effort to help make the most of your helmet shopping, we’ve put together a comparison of our six best-loved models. We’ve focused on four areas: venting, weight, retention systems and a mystery category. Safety is a given here, all of the helmets meet or exceed CPSC impact tests. Instead we’re examining a higher calling: fit, comfort, and vanity. We put Giro’s trifecta of high-end helmets under the microscope: The Ionos, the Prolight, and the newly-released Aeon. We also evaluated the Lazer Helium, the Catlike Whisper Plus, and the Louis Garneau Diamond. VENTING: The front profiles of today’s high-end helmets make it obvious that they’re built around their vents. It’s easy, and a mistake, to get hung up on the number of vents, however. The Catlike Whisper Plus takes the prize at 39. But the true measure ventilation is the total open area exposed to the breezes by the vents. For example, while the Giro Aeon has a comparatively paltry 24 vents, its vents are long channels with overall capacity to move air than the Catlike’s smallish ovals. None of these helmets suffer from a lack of airflow. In fact, with one exception, venting is now so advanced at the high-end, that we can’t determine if any helmet in the $150-plus price range is better or worse in this regard. The exception is the Giro Prolight. While the Prolight is a magnificent example of minimalism, its lightness is largely comes from its smallness. 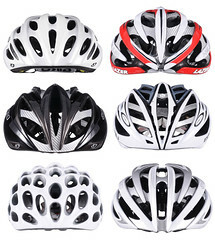 Because it’s a small helmet, the quantity and size of its vents are correspondingly reduced. While the Prolight isn’t suffocating in the summer heat, it doesn’t offer the same cooling airflow as the other options. Conclusion: If venting and airflow are you’re a-1 priorities, you’ll be satisfied with all of the helmets here, Prolight excluded. WEIGHT: The pro scene was fascinating in 2003. No, that’s not a reference to the stratospheric average hematocrit of the riders. Rather, I’m referring to an idiosyncrasy of what was the newly-implemented mandatory helmet rule back then: Riders were permitted to remove their helmets for race-ending climbs of 3 km or longer. That led to a circus of team leaders handing them off to domestiques or hurling them at roadside soigneurs. Sure, riders’ heads cooled off a bit. But imagine the unfettered glory of stripping off a pound of weight right at the moment the racing got nastiest. Cyclists are obsessed with weight in all of its forms: Body weight, frameset weight, component weight. There’s no reason to fixate on the lightness of a saddle while ignoring the same for your shoes or your helmet. It all matters. Conclusion: For the past two seasons, the dominant winner in the weight category has been the Prolight. But with the release of the Aeon, Giro provides the previously something previously non-existent: a nicely-adjustable, well-ventilated helmet that tips the scales at well below a half-pound. Technically, the Prolight is still the winner. But most riders will take the Aeon’s extra 18 grams in exchange for its extra technology. RETENTION: Two issues predominate when considering retention systems. First, will the helmet stay in place at any speed? Similar to good ventilation, this is something so fundamental today that it no longer warrants considerable thought. Each model has some form of a tightening mechanism at the rear of the helmet that wraps forward to the temples. By putting most of the head’s circumference is in direct contact with the system, these helmets stay fixed. Then the question becomes: is microadjustment simple and easy? The Giro Roc Loc 5 is what you’ll find on the Ionos and the Aeon. It sets the bar for adjustability. While its dial is small, its clicks are definite and the dial moves easily, yet precisely, with just two fingers. Adjusting during rides is no problem. As well, you can adjust the entire system upward and downward using a brace at the back of the helmet. The general concept is the same with Louis Garneau’s Spiderlock Elite system. It has a righty-tighty/lefty-loosie dial which you can rotate with two fingers. But that’s where the similarities end. The dial (not to mention the retention system as a whole) is vastly bigger. The dial turns and stays in place via friction . There are no discernable clicks. Both aesthetically and functionally it’s hard not to think of it as a dated Giro system. It’s possibly the least evolved of the mechanical retention systems we tested. Instead of a dial, the Catlike Whisper Plus goes with a straight serrated adjuster. It’s known as MPS suspension. Tightening and loosening it while standing in the garage is a piece of cake. The trouble comes with mid-ride adjustments. It’s difficult to tighten the system with one hand. The inherent friction of the serrations makes easy to accidentally over tighten the helmet. And loosening it mid-ride with one hand? Impossible. That being said, we do really like the Catlike’s ability to adjust the entire retention system up and down on your head. Other than Giro’s Roc Loc 5, it’s the only system that allows this. The surprise of the bunch comes from Lazer. Its Rollsys system is based on a dial at the rear top of the helmet. The dial, in turn, connects to two small metal cables which tighten or loosens the cradle of the retention system. The use of metal cables, rather than just plastic, allows for one-finger adjustability. Perhaps that’s why the Helium feels like it sits on your head with consistently even pressure throughout its circumference. Conclusion: The ease and precision of the Lazer Rollsys system leads the pack here. While the Roc Loc 5 is close, no other retention system is as well-designed. The top-mounted dial and metal cables are unique and offer superior adjustability. A dialed-in fit is the first step to helmet comfort and you get there more quickly with the Helium. MYSTERY CATEGORY: The helmet does more than protect. It’s a beast of burden of a different kind. As the sun dims behind the clouds or the horizon, the best helmets serve as a holster for your sunglasses. It is written in the PRO Book of Nuance that unworn sunglasses are never to be stored in a jersey pocket, nor are they to be hung from a jersey’s front zipper, or between brake cables and handlebar. If they’re not on your face, shades belong stuffed in helmet vents. Do Oakley Radars fit nicely in helmet vents? Conclusion: Speaks for itself, no? 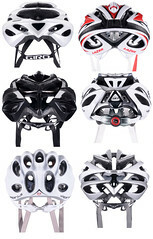 GRAND ALMIGHTY CONCLUSION ABOUT HELMET FIT, COMFORT, AND VANITY: Our vote goes to the Giro Aeon. It looks fabulous, it’s featherlight, and it vents like a champ. It makes the Ionos seem porky while it cannibalizes the very purpose of the Prolight. Yes, it costs 30 percent more than the Louis Garneau Diamond. But from the standpoint of technology and aesthetics it’s far more advanced. Honorable mention goes to the Catlike Whisper Plus and Lazer Helium. It’s not just because they, too, have attractive aesthetics and nicely advanced technology. We also dig them both thanks to their prominence in the professional peloton and simply because they’re not Giro products. Giro best-seller status is justifiably earned. But more often than not in life, we run away from rather than toward the best-selling anything.